Click here to visit the World Vision projects. Kickstart your own business with the cewas Start-up Programme! The cewas Start-up Programme supports dedicated entrepreneurs to develop their business ideas for a sustainable development of the water and sanitation sector. cewas is a Swiss-based non-profit competence centre combining expertise in sustainable water, sanitation and resource management with business innovation. The cewas Start-up Programme consists of 5 modules over the course of 1 year. The face-to-face training will be held from August 13th to September 14th 2018 in Switzerland and Sweden. The training is followed by 9-months remote coaching by renowned international experts. Modules may also be attended individually. For more information on the start-up programme and prices, please visit www.cewas.org. Thanks to our partner Swiss Re Foundation, there are 4 fellowships on offer for the entire Start-up Programme (covering programme fees, board and lodging, travel costs). Find more information on the Junior ReSource Fellowship here. Are you motivated? Then do not hesitate and fill in the online application form until April, 30th 2018. The earlier you apply, the better! Le développement de la petite irrigation est une priorité de la politique agricole. Une vingtaine de programme de coopération porte sur cette thématique. Toutefois, très peu d’information est disponible sur les capacités et besoins des exploitations familiales ainsi que sur le potentiel d‘extension des surfaces irriguées très variable selon les régions. Le programme en cours a pour but de renforcer les capacités des organisations partenaires à soutenir l’accès à l’irrigation des petites exploitations familiales et à améliorer les techniques de production. Une série d’enquêtes est menée dans les régions de Maradi et de de Dosso afin de d’analyser les caractéristiques des exploitations familiales, des systèmes de production et des économies familiales. Le programme a aussi pour objectif de préciser le potentiel d’extension des surfaces irriguées en exploitant l’imagerie satellitaire et les données de terrain issues des enquêtes. Une analyse diachronique permet d’analyser les dynamiques d’expansion depuis le début des années 1990. L’analyse spatiale est un élément important de localisation et de définition des stratégies d’appui au développement de la petite irrigation et de renforcement des capacités de plaidoyer des organisations paysannes vis-à-vis du ministère de l’Agriculture et des bailleurs de fonds. Le projet est financé par la Direction du Développement et de la Coopération, est mené par l’Université de Lausanne en collaboration avec Geo Expertise. Geo Expertise had conducted in collaboration with the Graduate Institute of International and Development Studies (IHEID) a campaign of collect geo-referenced data and satellite imagery analysis to assess the state of agriculture in Orontes Basin and North East of Syria. This study has contributed to assess the state of the agriculture sector and has identified the areas where the security and social condition allow to develop a rehabilitation project(Ar Ruj, Azmarin, Aldousat, …). The project monitired the state of irrigation schemes and assessed rehabilitation needs. 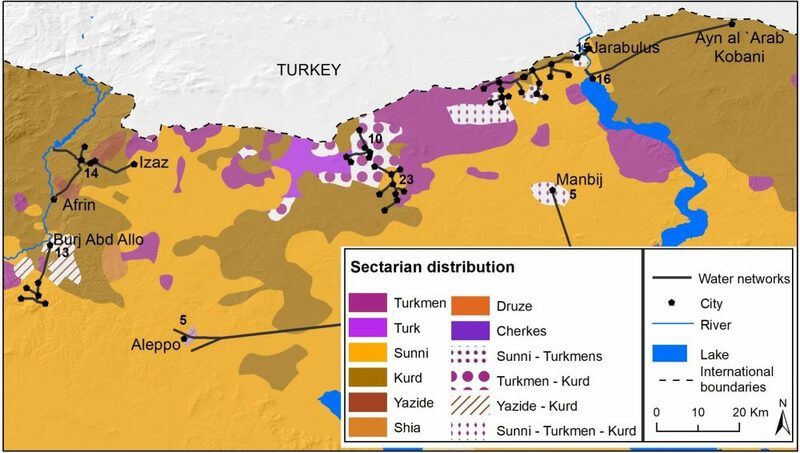 The Program has documented in north western and central Syria 25 water supply networks crossed by demarcation lines and/or ethno-sectarian territorial limits. The rehabilitation and management of these water networks requires the establishment of a negotiation and mediation process involving all stakeholders. A pilot project is conducted by Graduate Institute for International and Development Studies and Geo Expertise in north western Syria with the support of the Human Security Division of the Swiss Department of Foreign Affairs. At the request of local institutions and farmers, Geo Expertise completed a rehabilitation assessment of the Al Ruj irrigation scheme (Idlib – Syria) and began implementing the project after securing the required funding from the the Qatar Development Fund trough the Qatar Red Crescent. The project comprises the rehabilitation of irrigation canals, the repair or replacement of pumps and the installation of two electric generators. The current phase aims at restoring irrigation on 700 hectares for the production of food crops such as wheat, legumes and vegetables in order to raise the level of food security. It is expected that the production of wheat will be increased by 2,000 tons without over drafting groundwater resources. The project provides employment for farmers, experts, engineers and technicians. It contributes to improving livelihoods and reduces immigration. The number of beneficiaries of the project is estimated at 28,000 comprising 55% children. To ensure continuity of the project, a local management system was developed based on the establishment of a water user association and a funding plan was designed including the private sector, water users and funding agencies. The Ar-Ruj rehabilitation and management project was designed and is implemented by Syrian experts, engineers and technicians in collaboration with local institutions and water users. The project demonstrates the capacity of the population and Syrian organizations to take charge of the situation with the support of international agencies. Water Convention Singapore 2018 – Call for Papers! All papers received will be reviewed by the Programme Committee made up of an international panel of renowned water experts. Submissions close on 18 August 2017. Thank you in advance for additionally informing the Swiss Water Partnership (SWP) on your submission by sending an Email to: soraya.kohler@swisswaterpartnership.ch. For more information about the event and themes, please visit the following: Water Convention 2018. About: The biennial SIWW is where leaders as well as practitioners in water management from every corner of the world meet to discuss solutions to the growing water challenges around the globe. For general enquiries on SIWW, contact info@siww.com.sg or visit the official website at www.siww.com.sg. 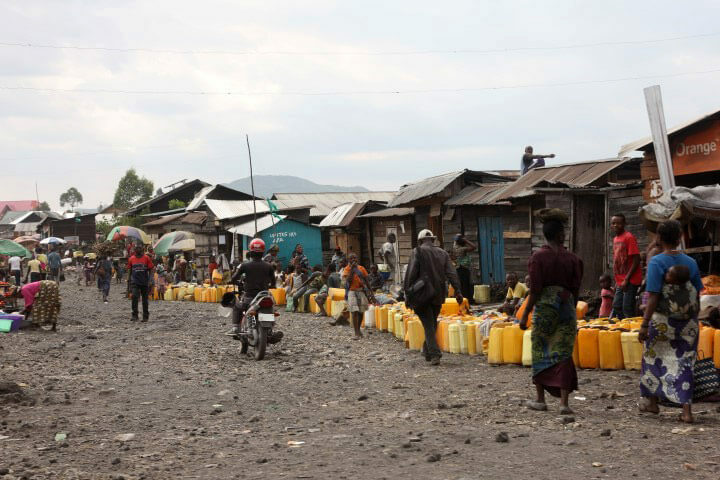 Through its local partner Fontes will provide water delivery services in DR Congo by taking over existing schemes to serve large communities living in rural and semi-urban areas. Fontes will add energy services as needed and develop the needed monitoring and payments systems. Fontes has been operating for over 10 years in Uganda and more recently in DR Congo. The Steribox pictured below sterilizes medical instruments using 1000 times less water and 100 times less electricity compared to conventional sterilizers. Other assets are its ease of use, cheap consumables and affordable price. Thus it meets well the needs of health centers and smaller hospitals located outside of main cities in developing and emerging countries. Steribox’ low running costs will allow to serve low income patients in particular.